Improve Your Posture & Increase Your Comfort With an Ergonomic Kneeling Chair that ROCKS! Due to an ergonomic design that pushes against your pelvis and automatically positions you in the ideal posture for sitting you may very well feel more comfortable in this Ergonomic Kneeling Chair than you have ever felt in any another type of office chair. And the benefits of this posture kneeling chair don't stop there. By putting you in the ideal posture, the chair helps to relieve tension in the back and neck. It also promotes improved blood circulation, which in turn can enhance energy and focus. This rocking chair rocks as you move, keeping your core and back engaged at all times - great for strengthening your back and core, and for the fidgety sitter. Whether you want to use this kneeling chair in your home office, for meditation, for posture correction, or for any number of other reasons, it can ensure your remain comfortable for long periods of time. Order your ergonomic kneeling stool today. It's great for feeling better, for working at a desk and for meditation. Just click add to cart and secure your posture chair by ordering now. If you have any issues at all, just send us a message, and we will personally see to it that you are satisfied with your purchase. Try this chair for 90 days - If you don't love it, you can return it! POSTURE KNEELING CHAIR -This uniquely designed ergonomic chair positions you with an open hip angle that encourages a more upright posture. This in turn will align your back, shoulders and neck and reduce pain and discomfort that can arise from sitting "slumped over" in traditional office chairs for long periods of time. BIGGER AND STURDIER - When compared to competitors, this ergonomic kneeling stool features larger seat and knee cushions (100mm or 3.95" compared to 70 mm or 2.75"; 3 wood cross timbers instead of 1 for added durability; longer fasteners for added strength; and 20 ply instead of 14 ply for strength and durability. In other words, this kneeling chair is more comfortable and longer lasting than the competition! COMFORTABLE - This posture kneeling chair holds up to 120 kgs (almost 265 pounds). The thick cushions on this rocking desk chair keep your knees and buttocks comfortable. Plus, the ergonomic office chair is designed to put your body in an ideal posture to relieve tension in the neck and back. 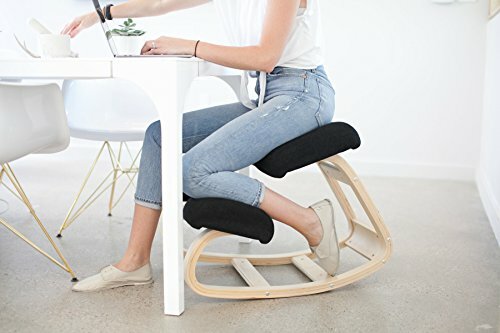 VERSATILE - You can use this knee chair as a desk chair, a meditation chair, a computer or gaming chair, a sewing or crafting chair or just a posture correcting chair. Whether you need an orthopedic chair to relieve specific pain or just want to feel more comfortable while you sit, this is the kneeling stool for you. It is made from 3-ply Birch for reliability. GET MORE DONE - This ergonomic kneeling stool promotes a natural, upright posture that helps to strengthen your abdominal and back muscles as well as increase blood flow and energy. Don't be surprised if you find yourself able to concentrate better than before which will enable you to get more work done or get your work done faster! Experience the ergonomic stool's benefits for yourself - Your purchase will be backed by a money-back guarantee.